Fortnite’s season 4 update has brought a massive array of changes, including new skins and sprays as well as removing the crossbow and bringing the usual set of new challenges. The biggest changes are to the map itself, with Dusty Depot turning to Dusty Divot after the meteor impact, and loads more new locales cropping up including a drive-in theatre and a new film set. Keep current on the latest Fortnite updates. Now that players have had a few hours to dig deeper into the map, we’re also seeing a bunch of much more secretive new locales. 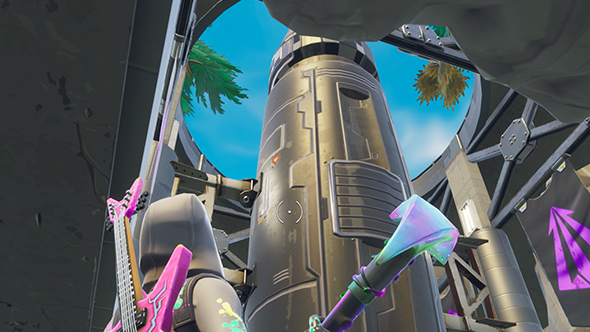 In keeping with the superhero theme, a number of heroic and villainous lairs have been uncovered around the map, including a missile silo that already has players jumping to conclusions about further destruction in season 5. The silo (via Autobecker and Philendrium on Reddit) is near Snobby Shores, behind a villainous-looking face built on a cliffside. There’s plenty of loot inside – if you survive the fall down the silo, that is. The presence of a giant missile naturally leads to speculation about it destroying something. I saw at least one person on Reddit suggest it could destroy Tilted Towers and I am definitely not prepared for another two-and-a-half months of this. Slightly less apocalyptic are the two other new lairs discovered so far. One is under the new Lonely Lodge mansion, filled with all sorts of nifty tech that gives it a proper Batcave-like feel. A similar, smaller hideout can be found in Salty Springs. If you thought the period of Fortnite speculation was over with the launch of the new season, it seems that’s not the case. The mystery of the meteors kept us all guessing for the month, and it seems Epic want to keep us on our toes.